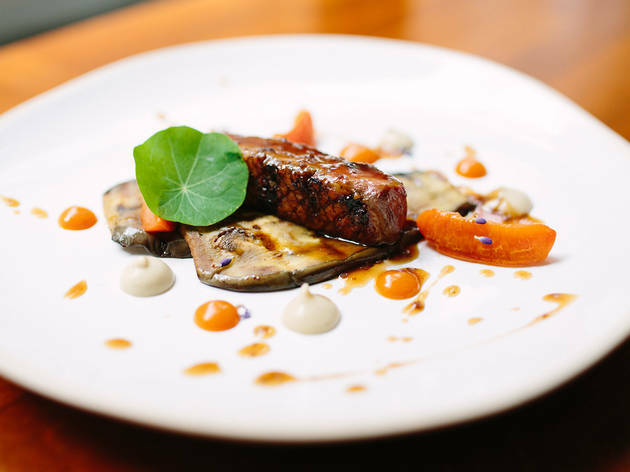 A smart-casual City spot and the first permanent opening by an ex-Ledbury chef. 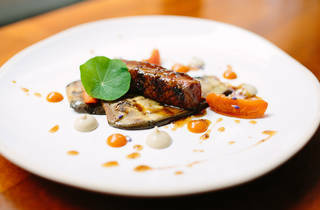 Since this review was published, James Cochran has moved to a new restaurant, 1251. Time Out Food editors, September 2018. 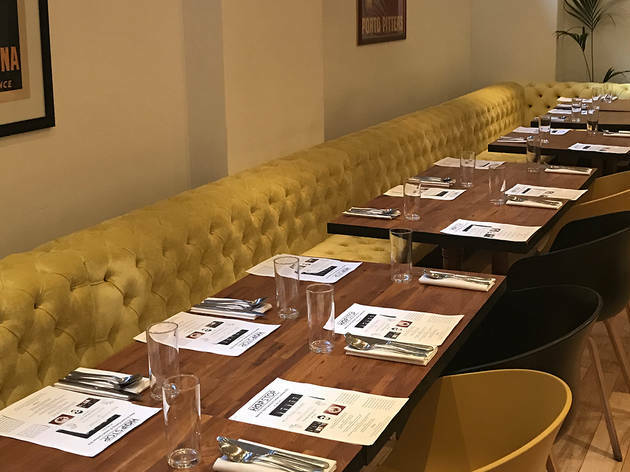 Bevis Marks: a peculiarly named street on the eastern edge of the City, full of ugly offices and dingy sandwich bars, but also home to the country’s oldest synagogue – and a much newer arrival, the first permanent restaurant under the aegis of one James Cochran. After five years at The Ledbury and a residency at BYOC in Soho, he’s picked the Aldgate/Liverpool Street interzone to put his name over the door. 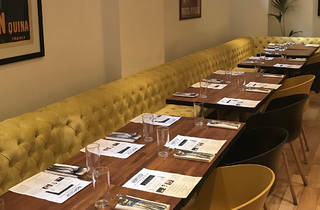 James Cochran EC3 is a light, spacious sort of a place, with big round tables and some harmlessly horrible paintings: just right for a smart-casual business lunch. It might struggle to stand out in the square mile if it weren’t for two things: the quality of the cooking (high, consistently) and the prices (low, relatively). Sourcing all your produce from English suppliers is one thing, but JC’s imaginative approach – hat-tipping to his Jamaican-Scottish heritage – is something else. 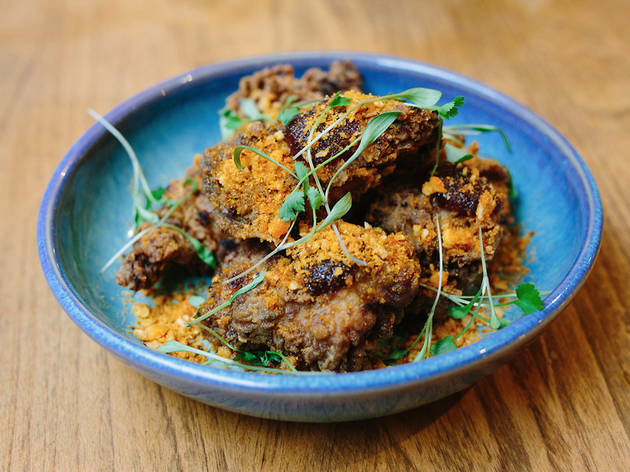 When you go, order the jerk buttermilk fried chicken with just the right balance of scotch bonnet heat and coriander coolness – get two portions if possible. Smooth and creamy goat’s curd came on a cracker made of porridge oats and marjoram (that’s English for oregano), and the salsify fritter was basically a big, truffly, rooty English croquette: again, get a couple. A parsnip dish (one of just a couple of veggie options) and a quince-and-honey dessert were solid too. My one big nitpick was aesthetic: enough with the Pollocky sauce dribbles! But strong food, affable service (they found us a spot despite being fully booked) and a pretty unbeatable lunch deal of five small plates for £22 make it hard to begrudge a bit of retro presentation. This is a place to treat yourself without having to venture out of your comfort zone – or your overdraft. Top (Bevis) marks. I absolutely love this place! Stumbled across here entirely by accident and was intrigued by the name. We came on a Thursday evening and it was the perfect atmosphere - buzzing but not too cramped and we positioned ourselves at the bar. We both had a sangria which was wonderful, and then to our delight treated to a few tapas while we were sat there. The olives in particular were gorgeous in an amazing oil, and the jamon was incredible, served with coriander on top which worked perfectly. The service was super friendly and the servers very knowledgeable. Will definitely be returning to eat properly! Absolutely brilliant food but service can be improved! 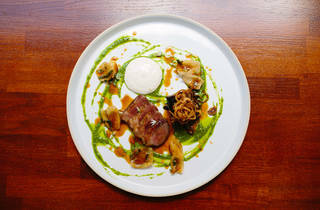 I went to James Cochran's restaurant for a team lunch this week and other reviews are right, the food is incredible. 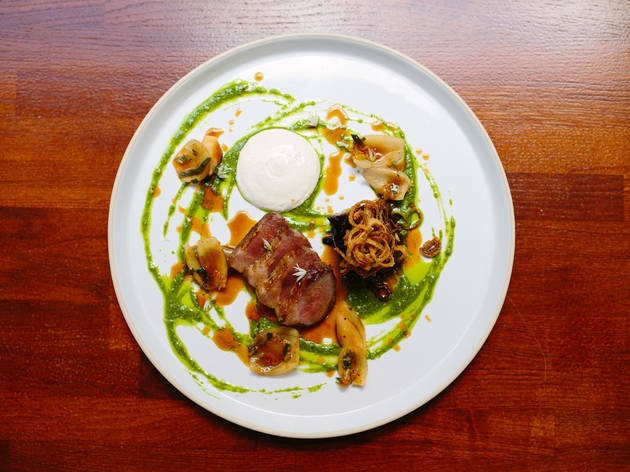 If you don't know what to choose in the menu, I recommend the wild grouse and gnocchis, the buttermilk chicken and the pork belly, all divine and well presented. For 4 people we took 5 tapas-style dishes and the special of the day (a dish advertised for 2 people). It was more than enough so I would recommend not to go for 2-3 dishes per person as they advise. However, the service was unfortunately really bad. We arrived at 12:30 when the restaurant was completely empty, we had to wait 45 minutes for our first dish and the main dish only arrived at 2:15 and by that time one of my colleagues already had to leave because we didn't plan on a 2-hour lunch break. The staff was nice and offered us free prosecco and desserts to make up for it but we were still very disappointed. Being a lunch spot in the City makes it clear that people cannot take 2 hours to have lunch. Maybe it was just a bad day but room for improvement there. Had a fantastic lunch here today. The restaurant was full and the atmosphere buzzing. The food was absolutely incredible especially the jerk chicken! Will be telling our friends and definitely coming back! Absolutely fantastic - we visited early December - worked our way through the menu with expert advice - not a carb in sight! Food was delicious - can't wait to visit again next time we are in London - loved it! I've said WOW three times because I've been fortunate enough to frequent the last three restaurants James Cochran has 'cheffed' at and three times I've been blown away with the quality, skill and sheer intelligence put into the dishes he creates. Whether it's a modern adaptation or a completely new flavour combination, this food always pleases. The menu always has plenty on to intrigue even the most discerning of eaters, so much so that often I wished I had a bigger belly so I can try more of this delicious food. This food easily matches the levels of Michelin starred establishments I've visited only the menu feels eloquently playful and leaves all the pretence at the door. I'd happily bring any of my friends, family and lovers to James Cochran EC3l and I'll most certainly be coming back again soon. Best new restaurant we have experienced in some time! There have been some issues with the decor... but with food this good, who really cares? 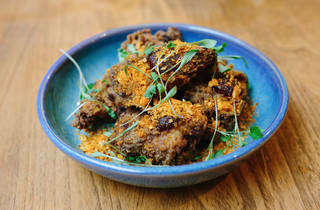 After experiencing a sunday roast at James Cochran's old gaff Restaurant Fix, I was buzzing to hear about his new venture with James Cochran EC3. Celebrated my girlfriends birthday there one Monday evening. Quiet and at one point the only people in there but who cares about atmosphere on a Monday night when the food is that good? We didn't mess about with choosing what to eat. By not messing about I mean ordering nearly every bar snack and small plate on there. A wise choice given how incredible every single dish was. Think you know fried chicken? Forget about it. This really IS the pengest munch. Not to mention the East London toastie, the roast parsnip, the salsify fritter and the pigeon breast to name but a few. All the food plus drinks for £95? Restaurants take note. Fine dining done right. We visited when the restaurant was very very new, they didn't even have a coffee machine yet. But did that matter? Not one bit! Who needs coffee when the food is so divine. We loved his famous jerk chicken (no one objected when we demanded more, mid course) and the lamb with burnt cream. My favourite dish was, in fact, the only entirely vegetarian one we ordered. Anyone who can make vegetables the best thing you've eaten all week deserves all the stars he can get!